Camp Moremi provides guests with comfortable Okavango Delta accommodation in luxurious East African safari tents. 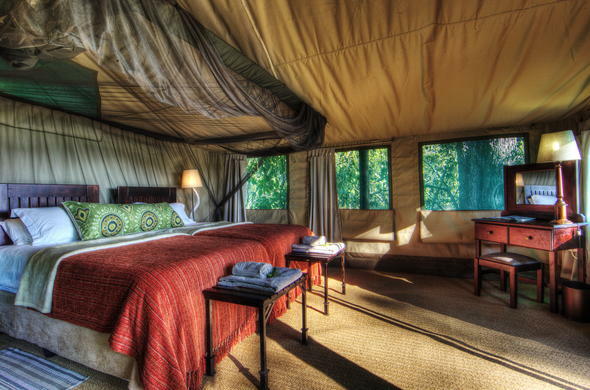 Camp Moremi provides elegant Botswana safari accommodation in 11 East African inspired tents. Each luxury tent has its own private hot shower and toilet. The safari tents are situated on raised teak platforms and boast their own private viewing decks. This Okavango Delta accommodation feature elegantly decorated interiors. The East African tents are furnished with Rhodesian Teak wardrobes, dressing tables, luggage racks, bedside pedestals and directors chairs. Moremi Tree Lodge features a cocktail bar, main lounge, dining room and a wildlife reference library. Camp Moremi houses only 22 safari guests in 11 beautifully furnished East African style safari tents with private facilities. The luxury tents feature comfortable yet elegant interiors. Each safari tent is furnished with a Rhodesian Teak wardrobe, luggage racks and a private bathroom with hot and cold water.